All casket and urn orders received by noon EST are normally shipped out the same business day. Rarely there is an unavoidable delay. In this case, you will be contacted through phone and/or e-mail and offered options. Be sure to give us a phone number where you can be reached. Memorial items and books may be shipped separately. Most memorial items are shipped with the casket or urn. Larger items that do not fit in the same box will be shipped separately. If the memorial item or book is shipped separately, it will be shipped within 2-3 days. Only Express mail has a guaranteed delivery date. This is a new website. Shipping is now determined according to items ordered. Our old shipping prices are below, and should be comparable. Since it is a new process, we may hit some snags. 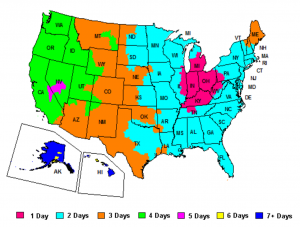 If your shipping cost is radically different, call us and we will determine the shipping cost. 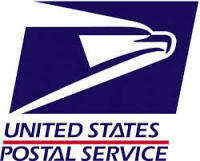 Unless you choose USPS Express Mail or Fed Ex Express, your package will be shipped USPS Priority Mail or Fed Ex Ground. If you prefer to have your order shipped to an alternate location than your home/billing address, please e-mail us immediately after you place your order. Usually takes 2-3 business days average) but is NOT guaranteed and occasionally can take more time – up to 10 business days. the time expected according to this map. If you are not ordering express and have ordered priority mail or fed ex ground, we may change how we ship your order if we think it will arrive to you sooner. USPS delivers on Saturdays but Fed EX does not. Fed Ex delivers packages according to the map above. If you have not chosen express we may change to another non guaranteed method. We do ship international. Please call us or e-mail with your address and what you plan to order in order. International shipping can be expensive. We will determine the size of the box and weight and calculate it with the shipping address to give you a total for shipping and then you can see if that works for you. UPS upon request only. Call for prices. These are usually comparable to Fed Ex.